Fayez Kazak and Nowar Yousef in "Speaker's Progress"
This is a chance to see something revolutionary—in every sense of the word. Performed by a cast culled from throughout the Middle East, “Speaker’s Progress” is not only a rich, layered satire on government censorship but also a work-in-progress negotiation of just what theatrical performances can achieve in an atmosphere of suppression. In many ways, this is the best play that could be staged so close to Dewey Square at this particular moment in history. His character is a playwright exiled from an unnamed Middle Eastern country in which theater has been banned as a subversive art form, rife with Western influence. The play beings with this character’s endorsement of the law and renouncement of his former work in the theater. What he proposes to show this audience is a document of a characteristically subversive work: a production of Shakespeare’s “Twelfth Night” adopted into Arabic with built-in revolutionary overtones. The production will be reconstructed, purely for the benefit of historical understanding, through the use of a few surviving film clips, and live performance to fill in the gaps in the audio/visual record. Its performers include a former actress, and representatives from a women’s league, a cultural ministry and a tourism board. At its beginning, the exercise is quite funny to watch. Petrified of appearing in anyway subversive, the actors strive to keep their presentation of this poetic romance as drily scientific as possible. Positions on the stage are announced in the manner of chess moves. The men are armed with yardsticks to ensure that the head-dressed actresses never step within an inappropriate distance of their male scene partners. Even in these conditions, even in Arabic with English subtitles, the message and the passion escape. In fact, the more they are restricted and forbidden the more attentive one becomes to them. As this fact becomes apparent, the cast seems to divide among those who wish to further the production’s original cause and those who wish to battle it back. The greatest threat to the cause is the representative from the tourist board, played by Fayez Kazak. This stern figure has been cast as the play’s equivalent of Malvolio, the haughty puritan who gets his comeuppance. 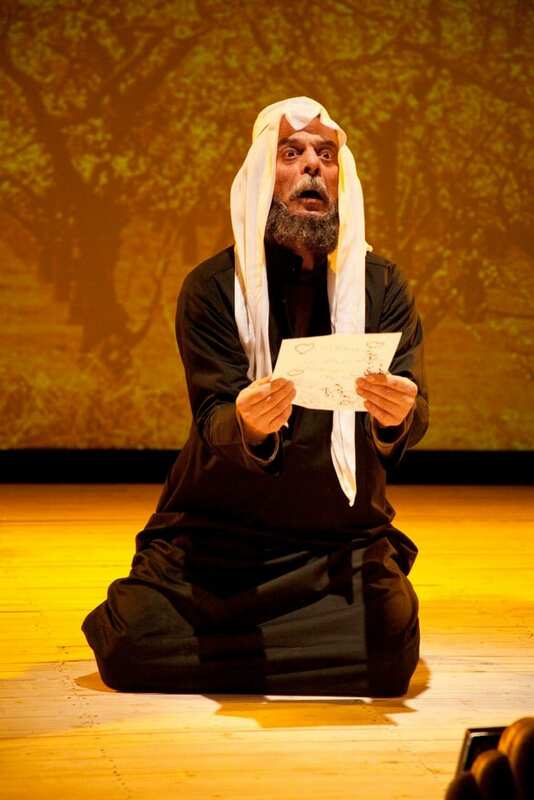 In the Arabic adaptation, Malvolio is a Mullah, the very figure who would have censored the play. Malvolio/The Mullah is undone by falling into a trap in which he is led to believe that he is beloved of a woman more powerful than he—in the Arabic version, her name is “Freedom.” He winds up behind bars, tortured. A similar trap is set for this member of the tourism board. He is seduced by the freedom of playing the juicy role of the Mullah, and while his guard is down, his fellow actors try to strip him of his power. Like much of “Speaker’s Progress” this drama plays out on at least four planes of reality at once. Engaging with it gives one some sense of how Sulayman Al-Bassam must feel as he strives to create works about conflicting cultures that speak to Arab citizens, government censors and Western audiences. It also speaks volumes about life under censorship and repression. It must indeed feel like a series of theatrical performances, full of potential for subtle subversions and charged with the constant threat of cages of all kinds. “Speakers Progress” is a deeply challenging work for a complex historical moment. It’s also funny, engaging and unique. Occupy a seat at the Paramount while you still can. “Speaker’s Progress” plays at ArtsEmerson’s Paramount Mainstage through October 16.